Wolves in Dogs' Clothing is the second novel in the Wolf Trilogy. It is New Year's Eve 1973 in Nicosia, Cyprus. New Zealand journalist Steve Carpenter is celebrating the occasion with his friend Inspector Petros Zimaras and his family and is looking forward to a happier 1974. But it is not to be. In the early hours of the next morning, Zimaras receives a call from UN headquarters on the island alerting him that their helicopter patrol has found a body within the Green Line, the buffer zone that separates the Greek Cypriots from their Turkish counterparts. This brutal event marks the beginning of a tumultuous year for Carpenter and Zimaras, as they are drawn into solving a series of cold-blooded murders against a backdrop of civil war and invasion. The two friends find their mettle tested to the limit, in a climate where they, and all the others who live on the Mediterranean island, are forced to question loyalties and long-held beliefs and to face threats from both within and beyond. 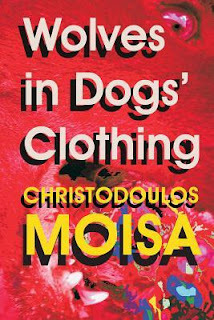 The second book in a trilogy by Christodolous Moisa, Wolves in Dogs' Clothing is his follow-up to The Hour of the Grey Wolf. The story picks up only a few months after the previous one finished, closing out 1973 and moving through to the end of a Cyprus summer in 1974. President Makarios is a pivotal figure again, targeted in a failed assassination which initiates a coup d'état and quickly leads to war. Within the conflict, we follow New Zealand journalist, Stauvro Marange (aka Steve Carpenter), as he navigates through the turmoil while also working with local police to solve a series of murders. Stauvro is now integrated in his parents’ community of Mpalloura. His neighbour brings him food when he is sick, and Sergeant Karageorgis, asks him to look after a crime scene while he attends to other matters in the nearby capital city of Nicosia. Moisa effectively re-introduces the principal characters, showing the progress of their relationship, and building empathy for them during this mini-golden age that is soon to be catastrophically disrupted. With the introduction of the crime scene and associated murder investigation, Moisa wastes no time initiating action and intrigue. Whereas The Hour of the Grey Wolf was, in some ways, a literary experiment, almost memoir in nature, including a short story and a poem as part of the narrative, Moisa steers clear of this in Wolves in Dogs’ Clothing. Still, there are times where Stauvro’s voice is encyclopaedic in his exposition, relaying the real-life situation in Cyprus preceding the book’s events. He even includes a sort of treatise about journalism and altruism. That’s not to say the background is not relevant or interesting. It is, and even if it may not be to some readers, Moisa can be forgiven as this is dealt with in brief sections of the first quarter of the book, embedded in a driving narrative which, for the most part, maintains a steady and earnest pace throughout, enabled primarily by sharp and realistic dialogue. The journalistic aspect of Stauvro’s life plays a central role in this sequel. In addition to his sleuthing support of his friend, Inspector Petros Zimaras, he is also working on an automobile smuggling story. We even see him travel to London and drive all the way back to Cyprus, in a plot diversion that seems tangential, but does lead to resolutions later in the story. However, the central investigation opens when the body of a young man is discovered with a gunshot to the head and four stab wounds to the back. This time it is Petros who invites his involvement, demonstrating the respect Stauvro had earned from his work in the first instalment in the series. We are introduced to the UN’s presence as they take an interest in crimes in Cyprus, seemingly ever alert for the growing tensions between the established Republic under Makarios and insurgents who wish to see the country governed by Greece. Tensions are high as Turkey also has a vested interest, understandable considering Cyprus’ position as a potential military base should conflict ever erupt between the two larger nations. Because Stauvro is more ensconced in Cyprus now, he has made some personal enemies. While he essentially remains neutral as a journalist amidst the conflict, Costas, who blames Stauvro for his father’s death in the first novel, has aligned himself with the insurgent group EOKA B. Regardless of Stauvro’s neutrality, Costas uses the chaos to enact revenge and establish himself as a legitimate suspect in at least some of the crimes being investigated. This personal connection, along with potential enemies made from his smuggling story, serves to increase the jeopardy tenfold from The Hour of the Grey Wolf. But Stauvro also has familiar helpers, such as Old Xenis, a favourite of mine, and his neighbour, Giagia Androutsou. On the heels of the coup, Cyprus is invaded by Turkey in an effort to prevent dominance by Greece and to look after established Turkish residents and interests. The coup and invasion seem to affect the genre of the story as Stauvro is then embroiled as a war correspondent for Reuters, able to cross various lines using his reporter status and New Zealand passport, but the mystery of the slain soldier lingers in the background. In fact, we suspect the murders are exacerbated by it as, within the chaos and overshadowed by other atrocities, more bodies are discovered around the island nation with the same wounds. With the possibility of a serial killer on the loose, Moisa enters new territory, complete with Da Vinci Code type symbolism. Like all good historical fiction, there are plenty of other interesting things to learn about in Moisa’s trilogy. Dates and place names, even street names, are carefully and explicitly indicated as Moisa accurately embeds his story in this tumultuous era. This is important to him, and it works for the reader without losing site of the crime story. Greek language is prevalent but always translated, as are some smatterings of French which I enjoyed. ‘I also told her what I saw in Nicosia after the coup d'état and in the first invasion. “How do you see things?” asked Melani. Melani is a lovely character who adds an element of romance to the series. She has a sweet relationship with Stauvro, but one that is difficult to nurture in such trying circumstances and in the end increases Stauvro’s jeopardy again. As he reflects, “Love is a luxury of peace.” Amusingly, however, Stauvro always makes time to check on his cat Scipio in Mpalloura. It’s a charming trait and one that affects plot as he often encounters scenes or clues or during these travels. Evoking admiration for the people of Cyprus is surely a major part of the author’s intent, drawing our attention to their manners, customs, culture, and fortitude. This is how we leave the people of Cyprus at the end of Wolves in Dogs’ Clothing, allowing them to rebuild. But with a third book forthcoming in this series, we can expect their peace, and Stauvro’s reprieve following another crime solved, to be short-lived. Wolves in Dogs’ Clothing is available in paperback and e-book formats on Amazon. Antony Millen is a Canadian living in New Zealand. He is the author of three novels and has recently been collecting awards, publications and rejections for his short stories. He blogs regularly on his website: antonymillen.com. Follow him on Twitter here.